Bill Lang (NAE '78) was not one to back away from complicated challenges. In fact, he dedicated his entire career to one of the most complex challenges around: the reduction of environmental and workplace noise through engineering. 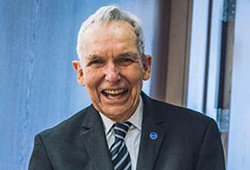 A pioneer in the field and a founder and president emeritus of the Institute of Noise Control Engineering of the U.S.A., Bill sparked — and to a large degree personally funded–the National Academy of Engineering's landmark 2010 report Technology for a Quieter America. He was a tireless advocate for the report's recommendations, regularly appearing before professional groups, policy makers, and the public. Of course, that took a lot of time and energy. So when Bill recognized an opportunity to simplify another area of his life – his personal finances – while at the same time supporting the NAE, he jumped at the chance. Bill terminated a charitable remainder unitrust that he and his late wife started years before. Because the NAE was one of the named beneficiaries, the Academy received its designated portion immediately. And in addition to a streamlined tax return, Bill received the instant gratification of seeing his gift in action while he was still with us. "A contribution to NAE could result in a very important study on a subject that federal agencies wouldn't support but that the Academy itself could examine," Bill said. "The National Academies can do a great deal for America. My giving is a way to support those efforts." We were deeply saddened by Bill’s death on October 23, 2016. Bill’s generosity leaves a living legacy at the NAE with the continued work of the TQA effort. He will be greatly missed. Is a Charitable Remainder Unitrust right for you? Use this calculator to see the benefits.